2008 USEF Horse of the Year Jamaica. A 17-year-old Dutch gelding that was rescued on his way to the slaughter horse is the 2008 United States Equestrian Federation Horse (USEF) of the Year. Jamaica, the foundation of Chester Weber's Four-in-Hand team that won Individual Silver at the 2008 FEI World Four-in-Hand Driving Championships, beat out four other nominees for the award. What he has achieved in his career is remarkable. "The horse is amazing," said Weber after receiving his trophy from Farnam's Chris Jacobi and USEF President David O'Connor. "It is great to be part of his life." The Dutch warmblood gelding [by Cambridge Cole S974 and out of Welkom (Noran)] was initially bought to be a tourist carriage horse, rescued on his way to the slaughter house. His refusal to stand still and be patient was the demise of that career but his tenacity and strength of character paid off when he landed in Weber's stable. Jamaica has been part of all six of Weber's Four-in-Hand National Championship teams, his results speak for themselves but if he could talk, the horse would have plenty to say. "It's a real honor to share this journey with such an unbelievable horse," said Weber. "Driving is a very small discipline in this country and the support from the rescue organizations and the letters I got from kids was amazing." The winning veteran will receive a year's worth of Farnam Platform feed for his efforts. Jamaica had some seriously tough competition from across equestrian sport. 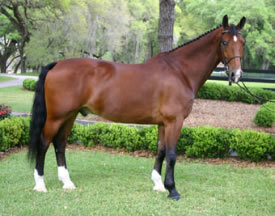 Adams Fire, a dynamic Half-Arabian, owned by Starline Arabians, LLC won eight National Championships in 2008 with three different riders, a huge testament to his versatility. Adams Fire won the 2008 US National Champion in Half-Arabian English Pleasure Open after a thrilling finish in a three-way work off. Tiziano dominated the 15 and Under Hunter division and has been Champion or Grand Champion 16 times in 2008, 15 for Jessica Springsteen. The ultra-consistent Tiziano won at Devon, the Washington International Horse Show, the Hampton Classic and Pennsylvania National. Tiziano, owned by Stone Hill Farm, kicked off the year by winning at the Winter Equestrian Festival three consecutive weeks. Friesian Quest LLC's Dante FQ dominated his division with an incredibly diverse resume. He excelled in saddle seat, driving, dressage and cross country jumping. He won 15 championship titles in 2008 including hunter pleasure/hack mount. The show jumpers were represented by Mollie and Harry Chapman's Flexible. The diminutive Irish Sport Horse gelding came back from two career threatening injuries to jump to second place at the Rolex/FEI World Cup Final in Sweden and was a integral member of the winning Nations Cup team at the CSIO5* in Spruce Meadows. Ridden by Rich Fellers, Flexible produced results all year, beginning with three consecutive $50,000 Grand Prix at Thermal in the spring. Over a hundred other awards were presented, including Grand Champions, National Champions and Reserve Champions across the various USEF Breeds and Disciplines.